Cromer and Sheringham basked in the sunshine this weekend – Perfect weather for the 2017 Cromer and Sheringham Crab and Lobster Festival. It took place from Friday 19th through till Sunday 21st May, Starting in Cromer and taking over Sheringham’s historic sea front on the Sunday. I only managed to make it to Sheringham on the Sunday but followed all the fun from the first two days in Cromer on social media. I really missed out and will make sure I am free next year to take part in the entire weekend! On the Friday night at Cromer Pier there was a concert at the Pavilion Theatre with Olly Day, Nigel Boy Syer, The Sheringham Shantymen and Marlene’s Dancers. The Festival really kicked off during the day on Saturday. They took over the Evington Lawns and held cooking demonstrations, crab dressing workshops, heritage displays and local produce stalls whilst live music and The Woodfords Beer Tent kept all hydrated. On Sunday the festival continued in Cromer, but also spread down the coast to Sheringham, closing off the seafront to traffic and taking over The Crown Inn’s car park. In Sheringham children were being entertained by Razz the Clown and Auntie Pearl and the Eastern IFCA’s amazing giant fish tank that held (believe it or not) various types of crab and a couple of HUGE lobsters. The team running the tank were friendly and answered all sorts of questions. AND they were brave enough to stick their hands into the tank! This guy may have been safe, but there were smaller crabs in there wandering freely that could have a good nip if they so wished! Up and down the high street the local fishermen had brought their boats ashore and were demonstrating lobster pot weaving and talking about the history of sea fishing in Sheringham. Around the corner towards The Mo were local craft and produce stalls such as beer and pottery, as well as The Sheringham RNLI and The Mo volunteers on a stall too, talking about their Respect The Water Campaign. With their 150th Birthday coming up there will be a post all about this soon. Whilst wondering around the food stalls I had a super healthy breakfast of coffee and fresh mini donuts. Because why not…. In front of The Lobster pub they were holding crab dressing demonstrations, whilst the Sheringham and The Sheringham Shantymen were performing in the beer garden. It was all a really lovely atmosphere, the sun, the food and the music. The local crowds all seem very interested in the displays and demonstrations and it must have been a real treat for tourists to learn more about the town in which they are holidaying in! 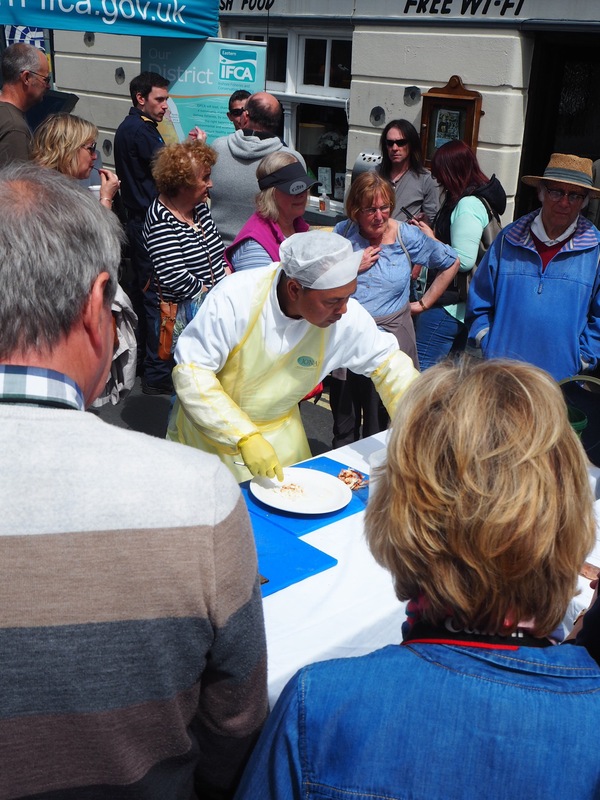 The one thing I am super sad I missed out on is The Worlds Best Crab Sandwich contest that was happening in Cromer whilst I was in Sheringham! Congratulations go to Henrys Coffee on creating the world’s best crab sandwich! I will be down there soon to sample this myself! I did however head to Joyful West’s Shellfish Bar and had a delicious lobster. My brother had ice cream from a parlour opposite but you can’t come to a Crab and Lobster Festival without actually having some…. right? 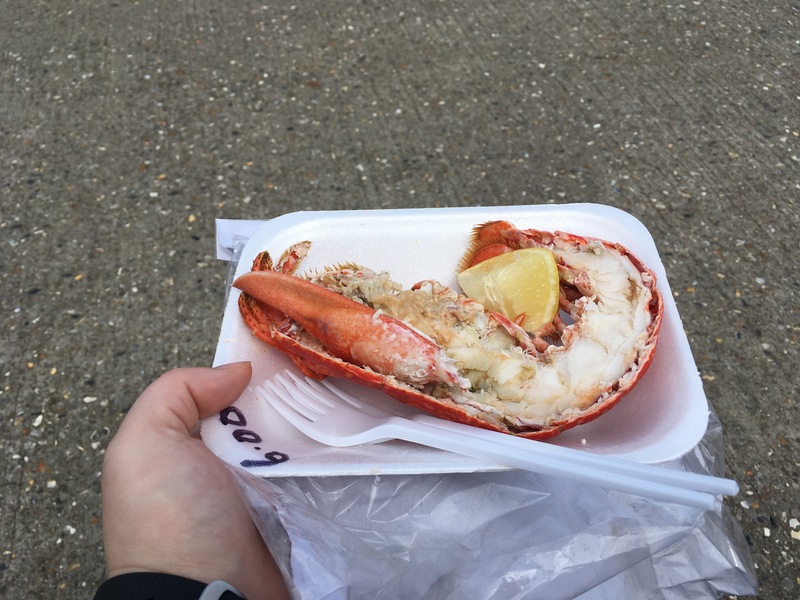 I had a fun afternoon in Sheringham, and as I said earlier, will make sure I attend both days next year- double the Crab and Lobster fun!